Both Chris and Adrienne were employed in non-farming pursuits when they started in alpacas. Chris Williams has a background in livestock following his education at Urrbrae, an Adelaide based agricultural school. He was first employed as a stock agent and learnt the skills of auctioneering. His auctioneering skills have been sought after at charity events in South Australia, and have also provided a source of entertainment at many alpaca functions in Australia, and in the United States and New Zealand. Chris has also worked in retail, managing a servicing business in the field of outdoor leisure and liquid fuels. Chris diverted his professional attention to alpacas on a full-time basis in 1997, excited by the opportunities and business potential of the alpaca industry. For over ten years Chris Williams has been best known as chauffeur and chaperone for a group of promiscuous alpaca males within a mobile stud mating service. On a monthly basis, Chris escorts several of Australia's highest profile males including Jolimont Warrior, Jolimont Cassius, Peruvian Ultimo and Peruvian Cortez, to visit alpaca breeders throughout Australia's eastern states and South Australia for mobile servicings. 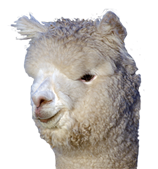 Adrienne Clarke is proud to claim responsibility for their involvement in alpacas. Her obsession with alpacas began in 1990 when she discovered the livestock in the nursery section of the Royal Adelaide Show. It was a case of instant attraction. Coincidentally, it was Adrienne's professional employment which some two years later reintroduced alpacas back into her life. Adrienne was employed as South Australia's first full-time female fire fighter with the South Australian Metropolitan Fire Service some twenty years ago. As fate would have it, she was posted under the command of an officer who was also an alpaca breeder. This officer convinced her of the virtues of alpaca ownership. Adrienne has maintained her career in the Fire Service in conjunction with pursuing her affair with the alpacas. Chris and Adrienne's diverse but complementing backgrounds have contributed to the development and growth of a vertically integrated alpaca business. Ambersun Alpacas has developed the primary product from conception (taken literally in the breeding of livestock) through manufacture, to the distribution of the value added product.